What to Look for When Buying Work Shoes for Flat Feet? For those who are cursed with flat feet or fallen arches, you are aware of how hard it can be to find boots and shoes that will properly support the absence of an arch. This is a fairly common condition that causes the entire base of the foot to come in contact with the surface below and can make walking or standing difficult. Like plantar fasciitis, the natural curve on the base of your foot that is supported by a ligament becomes weak and loses the ability to support the arch properly causing flat feet. People who have flat feet generally will experience sore, achy feet, swelling, and leg pain, especially when standing and walking for long periods on hard surfaces. For this reason, we have provided you helpful information on a few of the best work boots for flat feet. The Diagnostic Steel-Toe Waterproof Boot from Cat is specifically designed with comfort and durability in mind. These work boots are constructed out of full grain, waterproof leather that’s accompanied with a leather, padded, lace-up 6”shaft for additional comfort and support. The incorporated ERGO comfort system technology consists of a natural contoured interior that mimics the correct shape of a foot, allowing for additional support in the arch areas and provides flexibility with every movement. In addition, a removable EVA insert with gel technology provides additional support and cushions impact. This diagnostic boot is also equipped with safety features such as a rounded steel toe, and the rubber outsole is slip-resistant. As an added bonus, 200 grams of insulation is incorporated to keep your feet warm in the colder temperatures. Plus, a nylon lining wicks away moisture, keeping your feet dry. 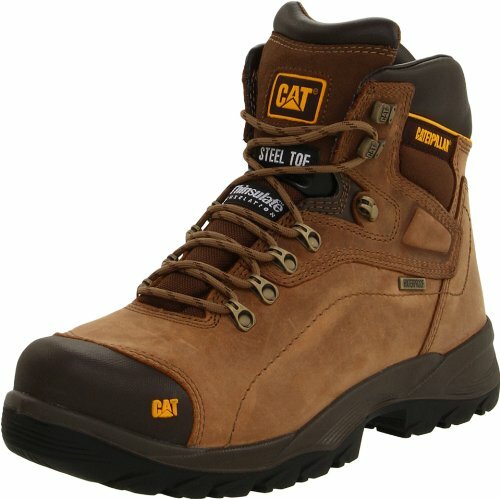 Specifically, the Cat Men’s Diagnostic Steel-Toe Waterproof Boot would be a nice choice for a hard working man involved in heavy construction, heavy machinery, or any other outdoor rigorous activity. As another boot recommended for flat feet are the Wolverine Men’s Buccaneer Boots which are constructed with multi-shock absorbing compression pads molded directly in the outsole providing thick, cushioning comfort with every step. A full grain waterproof leather upper accompanied with a matching 6” lace-up shaft, allows for added support and flexibility. 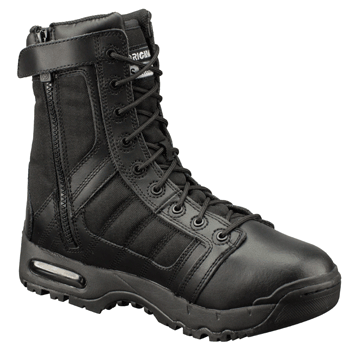 These particular boots feature a soft round toe, padded collar, and a breathable mesh lining. In addition, the rubber lug outsole is slip-resistant enabling you to remain steady on your feet during wet conditions. A nice bonus associated with the Wolverine brand is their 30-day comfort guarantee. If after 30 days of wear, and they aren’t up to your standard for comfort-ability, simply return for a refund. This particular style tends to run larger in size than your average shoe, a half size smaller would be recommended. However, keep in mind that larger stores such as Amazon have an excellent return policy. 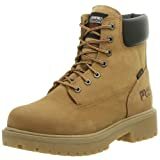 For those who work on cement, or other areas of employment, such as a golf course attendant, or outdoor salesman, these particular boots could be an ideal choice. Click to check other Wolverine Boots reviews. Not only does the Timberland PRO Men’s Soft Toe Boot accommodate flat feet, they are also designed to fit a wider foot as well. In addition, they are constructed with a water resistant full grain leather upper and matching leather lace up shaft for support, as well as a padded collar for comfort. Traction is aggressive on the rubber sole that is both oil-resistant and non-marking, providing a firm grip on various surfaces. For warmth, 200 grams of insulation is incorporated along with an antimicrobial treatment that is applied to the footbed and the mesh lining to prevent odors. Furthermore, the nylon shock diffusion plate supports your foot and keeps it rigid where most needed, plus disperses pressure and eliminates fatigue. Sizing for these particular boots run true. They are a bit heavier than a tennis shoe, but light for work boots. The Men’s Soft Toe Boots are ideal for those who work long hours on their feet, like concrete workers or roofers. 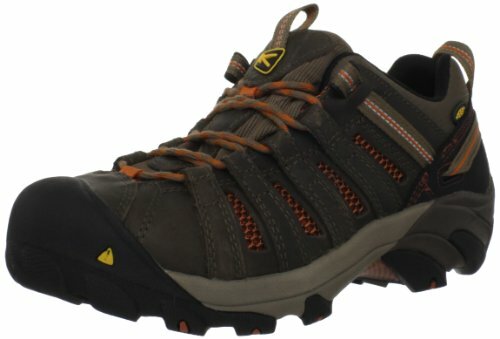 If you’re looking for a work shoe that offers that additional support for your arches, the KEEN Utility Men’s Flint Low Work Shoe can support your flat feet with the EVA dual-density removable foot bed and the dual-density compression molded midsole that not only cushions your feet with every step, but has a contoured heel lock to keep your foot in place without slippage. As a flexible, lightweight work shoe for easy movement, it also is constructed with safety features such as asymmetrical steel safety toes that are ATSM and Electrical Hazzard rated, and a non-slip, oil-resistant outsole with added traction for a firm grip. These KEEN work shoes are manufactured with waterproof leather uppers that keep your feet dry in wet weather, though they are not equipped to handle extreme cold weather. However, as a nice work shoe for wide and flat feet, plus the additional provided protection they could be ideal for casual wear as well as a tough working environment. Roofers and H/V A/C technicians who constantly climb ladders can benefit from these work shoes, specifically because of the flexibility and support they offer. The Timberland PRO series has come up with the Mudsill Low Steel-Toe Lace-Up shoe to add to their line of work shoes that offer support to flat feet or fallen arches. 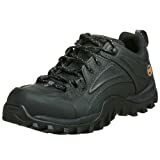 As a work shoe, they feature a durable steel toe that will protect your feet from injury due to impact and compression. In addition, they also feature electrical hazard protection which is especially nice for electricians, or any other person who is subjected to electrical currents. The non-slip, oil-resistant rubber outsole with a reinforced toe keep your feet planted firmly on the ground. An antimicrobial lining detours and eliminates odors that can accumulate during extended wear. For comfort, an EVA midsole lightweight contoured midsole provides that needed cushioning for your feet. Particularly nice, is the breathable leather and fabric upper that regulates temperature sufficiently. These particular work shoes require minimal break-in time and are comfortable right out of the box. Lastly, these work shoes would be a nice selection for public safety officers as well as a millwright in the construction field. This work shoe is particularly good for going from the office onto a work site, which is beneficial for a contractor. It’s a stylish, professional looking shoe that offers the protection of an ATSM safety rated steel toe with an electrical hazard deterrent up to 18,000 volts for those hazardous working environments. Furthermore, the Soft Street outsoles absorb the shock from treading on pavement and cement, plus they are slip and abrasion resistant. Another shock absorbing feature are the removable insoles that assist in cushioning the ground impact. In addition, these shoes are also equipped with a lightweight fiberglass shank that offers flexibly added support. The shoe itself provides adequate arch support for those with flat feet, and the heel of the shoe is nicely sized. A downfall to these work shoes is, they are not waterproof, they can, however, be treated with a water-resistant application. Click to find a waterproof boot, or read more boots by Thorogood. What if you already have a great pair or shoes or boots that meets all of your other safety requirements but still don’t provide the necessary support for your feet? The best way to fix this is to add new insoles! Custom orthotic insoles can be purchased from a doctor but are often overkill and cost quite a bit of money. Many high quality insoles can be purchased without a doctor and provide great support. The Tread Labs Stride insoles are available in four different arch heights and various sizes to ensure a precise fit, prevent fatigue, and improve your foot’s natural shock-absorbing ability. They are particularly effective for relieving the pain of plantar fasciitis and flat feet. If So, What Can You Do About Them? Inflammation or history of damage to the tendon referred to as the posterior tibial tendon. It’s the tendon that connects your lower leg and runs down your ankle to the center of the arch. You can determine if you have flat feet by performing the following test. Wet your feet, and then stand on concrete or cement. Step back and examine your footprint. If your entire foot has made an impression, you may have flat feet. A normal footprint will display a visible absence in the center of the foot where the arch is present (see images). With so many choices available for work boots and work shoes that are designed to accommodate a person with flat feet, it can be a tough decision, and if you’re not aware of what to look for, it can be confusing. In this section, we will provide you information that will help. As we know, flat feet can be quite painful, and wearing incorrect footwear can worsen the problem. Not only will your feet remain uncomfortable, but improper footwear can eventually lead to other problems such as leg pain, back pain, and of course poor posture from compensating for the discomfort. Here are some specifics that you should look for in a work shoe or work boot for flat feet prior to purchasing. Arch Support – arch support is one of the main factors in selecting a shoe or boot for flat feet, as they are what mold your arches to that of a normal foot. An arch of a foot serves as a natural shock and weight absorber. If an arch is absent, it’s because the ligament is damaged or lacking the strength to support the natural curve of the arch. A work boot or work shoe should contain an insert or a footbed that curves upward in such a way that it molds the foot and absorbs the impact from walking on hard surfaces. This also can be obtained by including orthotic inserts. Higher Insoles – raised insoles are designed to provide an artificial foot rest and provide support to the center of your foot. Midsize Heel – You need to look for happy medium regarding the heel of a shoe or boot. Low, flat heels provide absolutely no support for your already flat feet. A heel that is too high can cause unnecessary pain, and forces your foot into an uncomfortable position. A shoe or boot with a medium heel height adds just enough support to your heal and maintain an equal balance between high and low. Avoid Slip-on Shoes or Boots – Look for footwear that has laces, buckles, or straps, as they can be adjusted easily for comfort and support. A slip-on shoe isn’t adjustable, and can’t be customized to help you. Understand the Shape and Size of your Foot – It’s essential to pay attention to the size and shape of your foot, and then select shoes accordingly. If you have a wider foot, aim for a boot or shoe that accommodates or is made for wider feet. In order to find your proper size, measure your foot while standing. 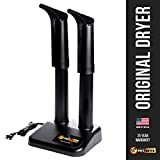 This enables an accurate sizing because your weight is placed on your feet and the foot will naturally widen while standing. Wear Socks – Make sure when you are trying on footwear that you wear your normal socks. This will also ensure you are getting the proper size. Afternoon Shopping – Your feet naturally swell towards the end of the day, so by shopping in the afternoon, the shoes or boots you try on tend to be accurately sized and will prevent you from experiencing tightness at the end of the day. Even with flat feet, there is hope in finding comfortable footwear to accommodate your condition. It’s not necessary to compromise style and comfort just because you associate orthotic shoes or boots with something medically unattractive. We are here to guide you in the right direction and make you aware that there are some outstanding choices for the best work boots for flat feet. To clarify, we are not attempting to promote any one brand or style, just provide a variety of the work boots available to you. Lastly, your feet are, and will always be an important asset to your hard-working lifestyle. It’s imperative that you take care of them properly.